I’m not sure where you live but It’s been unseasonably cool for this time of year in Wisconsin. Normally this is the season of air-conditioning, long swims at the pool and mosquitoes. It’s early August as I write this review and I’m wearing a sweatshirt. 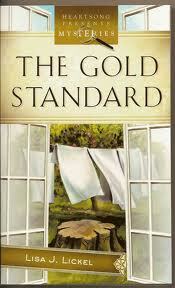 It’s the perfect weather for snuggling up with a cozy mystery and that’s exactly what author Lisa Lickel delivers in her book of The Gold Standard. Set in a small town in northern Wisconsin, Judy Winters is forced to deal with the aftermath of her Aunt’s suspicious death. She inherits a farmhouse with the promise of hidden gold on land sought after by a militant tree-hugger group. Not knowing who to trust, she seeks to use her unusual talent for being able to tell when people are lying. Judy struggles to evaluate the colorful cast of characters that made up her Aunt’s life. With a pushy boyfriend as well as an attractive neighbor, named Hart, who just so happens to help out around the farm, and a crazy cat with an unerrant propensity to preserve Judy. This story earns it’s designation as cozy. There’s a mystery and some suspense but not over the top anxiety producing. The romance is well-paced and at times I couldn’t help but smile at some of their interactions. I would love to share more but I don’t want to give any spoilers! Let’s just say there’s poison, a diary, hidden secrets, a bomb shelter, cows, and more than one romance blooming in the shadow of attempted murder. There is a gently placed faith line to the story as well to encourage the reader and ground the actions of the main characters. This is the first in a series of books and I reviewed book number two, The Map Quilt. (You can read the Map quilt Review here: https://susanbaganz.com/2012/06/19/the-map-quilt-buried-treasure-mysteries-book-2-book-review/). Regardless of the order in which you read these novels, they stand alone just fine. (the third is The Newspaper Code and I look forward to reading that one too and see what adventures Judy and Hart have next). So on a chilly summer day, go visit northern Wisconsin with Lisa and her cast of characters and be charmed and entertained. Everyone needs a smile on their face and Lisa will help put it there. I read it too, and second your assessment. Although this coming week one may need to curl up in front of the air conditioner! I’m glad you enjoyed. Thanks, Susan and Anita.